Brookies . . . Brownies plus chocolate chip cookies. All rolled together in one spectacular treat that will make your mouth happy. 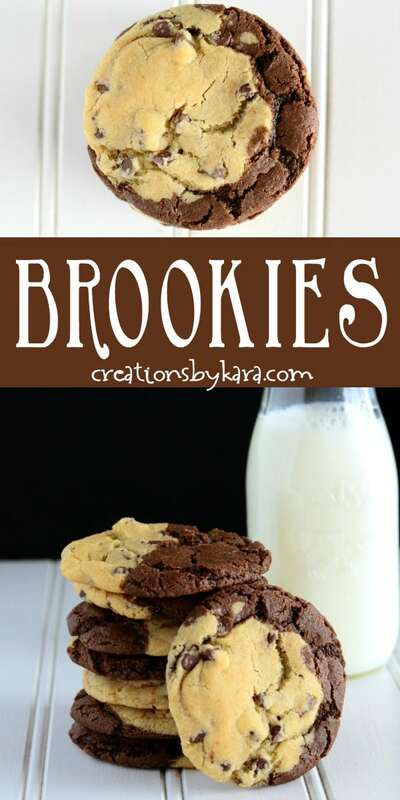 Can’t decide between brownies and chocolate chip cookies? With this recipe, you get the best of both! Cookies are a yummy treat. Brownies are a yummy treat. Put them together into one treat and you just might explode. Just kidding. Do I have your attention now? Seriously, these cookies taste A-mazing! Plus they look all fancy like they came from a bakery. So you can totally impress your friends. Chocolate chip cookies have always been a favorite of mine. But sometimes I want something a little more chocolatey. You know, like brownies. When I saw a recipe for Brookies over at Mel’s Kitchen Cafe, I knew I had to give them a try. I figured combining two of my very favorite treats had to be a win. Which of course it was. An epic win actually. 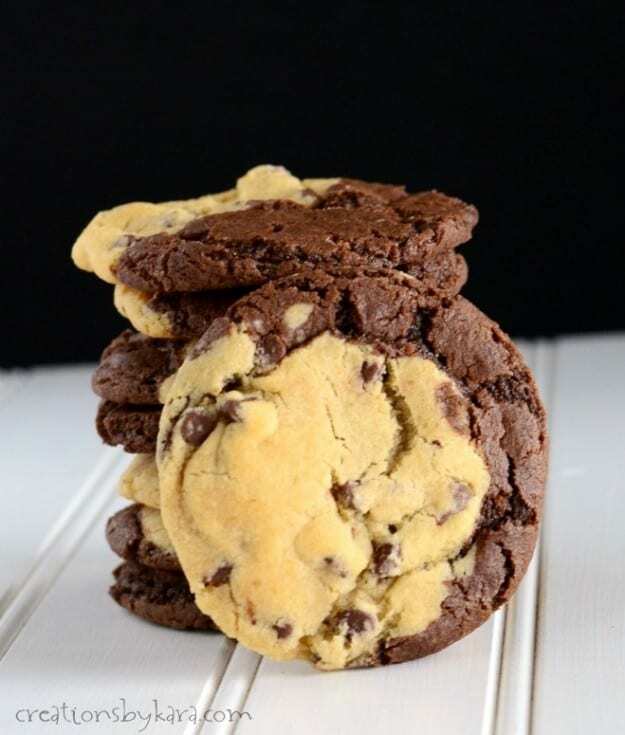 These cookies are soft, chewy, and filled with chocolate goodness. I ate way more than my share of them. Beware, they are scary good! -Don’t forget to make the brownie dough first. It needs to be chilled so it firms up and doesn’t spread too much while baking. -I added baking powder to the original recipe, because I like tall chunky cookies. Since I live at a high altitude, I tend to get flat cookies without it. But I think even if you live at sea level, you should be fine following the recipe just as written. -I have a stand mixer and a Bosch, but for making cookies I like to use a hand mixer. It’s great for creaming the butter and sugar. -I love my silicone pan liners and use them every time I make cookies. Nothing sticks to them! -You can use regular chocolate chips, but I like using mini chocolate chips for this recipe. You get more chips in every bite, and the dough is also a little easier to roll together. 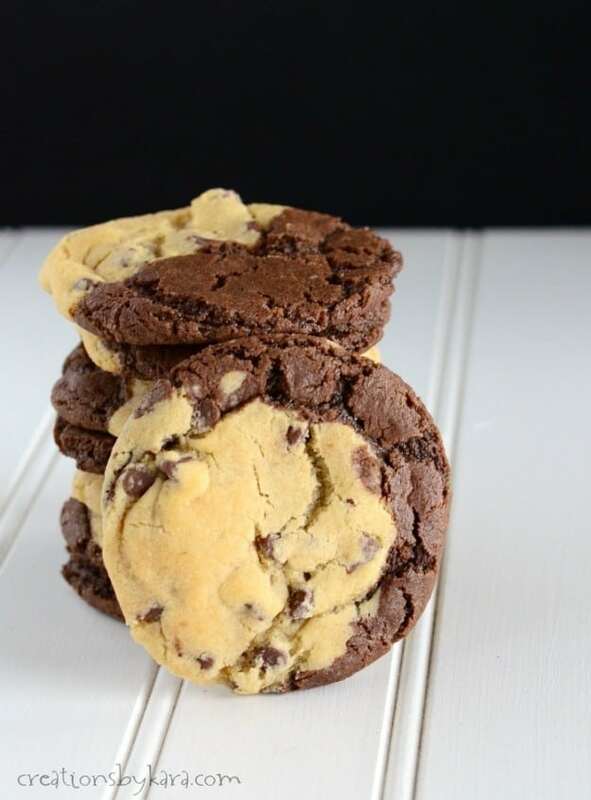 Half chocolate chip cookie, half brownie. FOR BROWNIE DOUGH: Cream butter and sugars in a large mixing bowl. Add the egg, yolk, and vanilla and beat till creamy, about 2 minutes. Combine flour, cocoa, soda, baking powder, and salt in a small bowl. Sift into the sugar mixture. Stir till dough is just combined. Cover and chill while preparing chocolate chip dough. FOR CHOCOLATE CHIP COOKIE DOUGH: Cream butter and sugars in a large mixing bowl. Add the egg, yolk, and vanilla. Beat till creamy. Whisk flour, soda, baking powder, and salt in a small bowl. Add to the sugar mixture with the chocolate chips. Stir till ingredients are well mixed. TO MAKE BROOKIES: Take a small portion of brownie dough and roll it into a ball. Take a small portion of chocolate chip dough and roll it into a ball. Lightly smash the balls together, and form a new larger ball of dough. Place dough on silpat lined or lightly greased cookie sheets. Flatten slightly with your hand. Bake at 350° for about 10 minutes. Cool on pans for 2-3 minutes, then remove to cooling racks to cool completely. If I freeze the extra dough, do I put it in the over straight away or thaw first? I’m usually in a hurry so I put it in the oven straight from the freezer and add a few minutes to the baking time. But they actually do turn out a little better if you thaw the cookie dough balls first. Scoop cookies and freeze for 30 minutes. Has anyone ever froze this dough or this cookie baked? If so, is is it better to freeze before or after baking. Trying to get ahead on Christmas baking. I have frozen the cookies before with great results. I just put them in freezer ziplock bags and they last for a few months. I think you could probably freeze the dough after you roll the balls together. 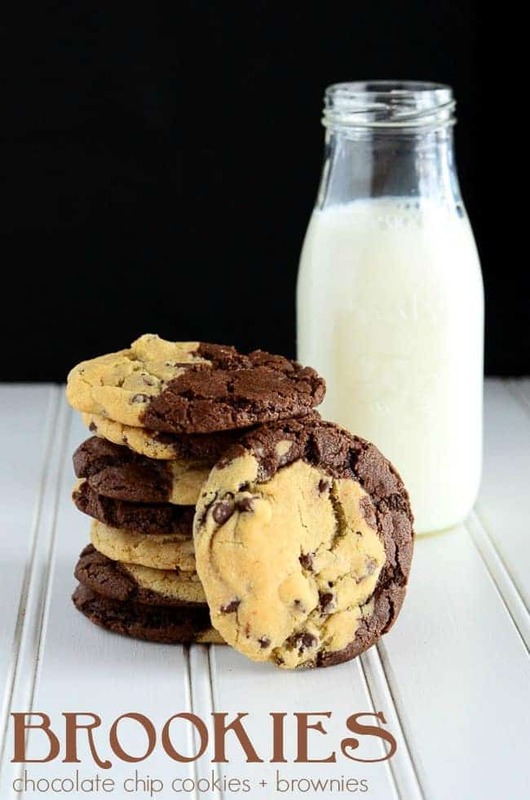 I haven’t tried it with this recipe, but I’ve tried it with many of my other cookie recipes and it works great for all of them except the ones with oats. Good luck and happy baking! We have made these many times and love them!! My only complaint is the name Brookie which is the duch word for underwear, so there is often a giggle whenever we call them that!! Oh my goodness, that’s hilarious. I had no idea. I hope my boys never find that out, or I’ll never hear the end of it. Haha! These look amazing, by any chance is it possible to make them a Vegan? I’ve never tried it, but it’s definitely worth a shot! I tried your recipe and it …is amazing! My kids love them and their friends when they come over keep asking about them. Thanks a lot for putting it up! I put the brookies in a cupcake pan instead of on a cookie sheet and they were great!!! Not too spread out and soft in the middle. Thank you for sharing your recipe! I made these for the eclipse celebration. Perfect! Oh man, I wish I would have thought of that. What a great idea!! How clever to use them for the eclipse! Hope I can remember that idea for 2024 when we will be in the direct line of the eclipse! I hope you loved them! They are one of my very favorite cookies ever! No matter what, I always seem to have trouble with regular old chocolate chip cookie dough. I always crave my mom’s recipe, but when I try to use it, the cookie dough — and the cookies — never turn out like hers. Both doughs in this recipe, though, were stellar, even for someone as inexperienced and unlucky at making cookie dough as I am. I’d say the one downside is that making both doughs required a lot of dishes, which I’m pretty sure is because I’m still getting the hang of this baking thing. I made one pan of cookies the night I made the dough (which was tough because with only a few hours of chilling down, the doughs were pretty sticky) and promptly returned the doughs to my fridge where they sat until the next morning. After a night of chilling, the doughs were still pretty soft, but they were a little bit easier to handle. It seemed like the texture of the cookies turned out even better that way. 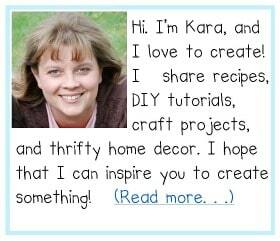 Thank you, Kara! This recipe will definitely have a place in my recipe book. Saw this on Pinterest, made them tonight. These are delicious and so easy!! Thanks for a great recipe!! So glad you liked them Tanya! I’ve now made these cookies several times and they consistently turn out exactly as pictured. A beautiful show stopper! However, I find them more like a choc chip cookie mixed with a double choc chip cookie, as opposed to a brownie… as in you make 2 similar cookie batters but one has cocoa and the other doesn’t. Just made these. And they look great. But turned out a little bland? Or not so sweet. What did I do wrong? Or can do differently next time? I’m not sure why they turned out bland, they are plenty sweet for me. Did you by any chance use unsalted butter or omit the salt? That would be the only thing I can think of that would alter the flavor. I just made these, and they are delicious! they dont quite look the same though, not the “cracked” look.I live in australia and we dont have baking soda here, we have bicarbonate of soda, are they interchangable? i used self raising flour instead of putting in the baking soda, but i did use the baking powder, any ideas why they dont look the same? Baking soda and bicarbonate of soda are the same thing. If you used self raising flour, it has baking powder in it, so that may explain why they looked a little different. Hi! Can I half this recipe? If yes, can you teach me how? Thank you! This recipe is not easily halved, because it is pretty challenging to use half an egg and half an egg yolk. But the cookies do freeze well, so you can save the extras for another day, or just share them! These look amazing! I’m going to make them for our Memorial Day Picnic! Thank you for sharing! I just finished up my first batch of this WONDERFUL cookies. I love it when they turn out just like the picture. I tend to make my cookies bigger, so mine needed to bake 17 min. Just got a new Kitchenaid. Just having so much fun baking and mixing. Can’t wait to try your other recipes. Thanks again!!! Found these today and am making the for tomorrow. They turned out perfect! Thanks for sharing such a great recipe. Found these on Pinterest last night, and the first batch has just come out of the oven :-D. Is there any trick to stopping the brownie dough sticking to your hands? I’m re-chilling it at the moment (my kitchen does get quite warm), but I was wondering if I need a bit more flour / cocoa powder next time? Hi this looks yummy hopefully when school is closed I will be able to make it from scratch but right now i am in a rush and I wanted to know if there is a cheat sheet I can use. I have to make it last min soooo my question is ..
Is it possible if I can make it with the prepackaged bags for brownie and chocolate chip from any brand ? I think you could get away with using pre-made chocolate chip cookie dough, but not a brownie mix. Brownie mixes make more of a batter, so it would run all over the place and make a big mess. I’ve never purchased cookie dough, so I don’t know if chocolate chocolate chip cookie dough is even an option, but I’d try that if you can find it. Oh YUM!! These Brookies look so soft and delicious! The best of both worlds, in one delicious cookie! Haha, they’re the perfect choice for all those indecisive days I have! 🙂 Pinned! Oh these look good, but too good for my healthy eating goals right now and I sadly have no willpower against goodness. Pinning these for later though! Yes, better to save them for later. They are definitely a will-power killer! oooh! You are right, I might just explode! These look wonderful! These look FABULOUS! My youngest will love them even more since that’s one of her nicknames! Totally going to have to try these soon. Cute nickname. 🙂 And you will most definitely have to make them!